SINGAPORE - Cherry blossom chasers, take note - the iconic sakura are forecast to bloom earlier than usual this year in Japan. Tourists who want to catch the first sightings of the pale pink flowers should keep their calendars free for the second half of March. The Japan Meteorological Corporation (JMC) said last Thursday (Jan 10) that the Kochi prefecture will be the first to see the sakura blossoms as early as March 18. Last year, spring arrived early across the country, with buds starting to appear in Tokyo on March 17. In Fukuoka, blossoms are expected to emerge on March 20, followed by Tokyo and Nagoya on March 22. Kyoto will see the beautiful blooms on March 25 while the flowers are forecast for Osaka on March 27. The flowers will take about a week before they reach their full splendour, as Kochi's cherry trees are forecast for full bloom on March 25, and on March 29 for Tokyo and Nagoya. In the northern parts of Japan, such as the Miyagi and Aomori prefectures, the flowers are due to appear in April. Hokkaido will likely see the blooms only in early May. 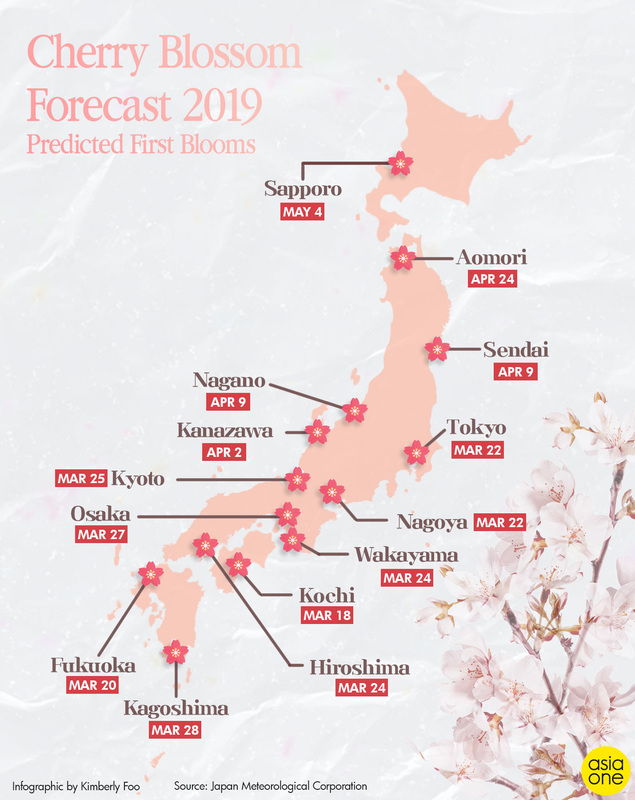 The forecasts cover about 1,000 locations across the country and are based on data from the blooming characteristics of the someiyoshino tree - the most common type of sakura tree, according to the JMC website.